You are going to Watch Naruto Shippuden Episode 332 English subbed online free episodes with HQ / high quality. 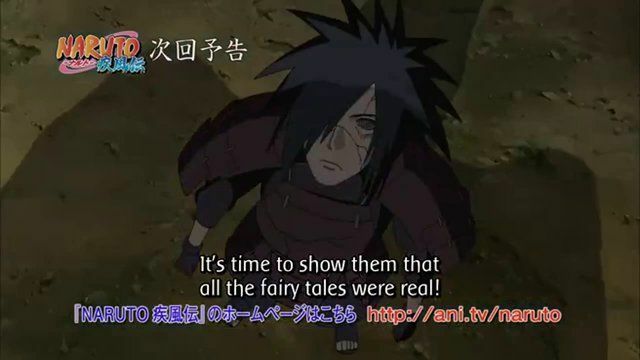 Stream Anime Naruto Shippuden Episode 332 Online English sub A Will of Stone. The intense battle between Madara and the five Kage continues as Ōnoki attacks Madara with a gigantic rock golem. However, Madara counters with his Wood Style: Deep Forest Bloom, shattering the golem into pieces. Tsunade remembers the jutsu being her grandfather’s and as the jutsu released its pollen, she instructs the Kage not to inhale. Gaara suspends the Kage and Ōnoki levitates A. Kabuto muses on how people thought no other shinobi is as powerful as Hashirama Senju, just like how people consider the powers of the Sage of the Six Paths a myth. Elsewhere, the Hokage Guard Platoon along with Dodai and Sagan continue to pursue Mū. While the Kage are distracted, Madara unleashes his Susanoo, causing them to fall through the trees. Madara proceeds to set the forest ablaze and not long after, the five Kage became unconscious.